Data Acquisition, in the broadest sense, is a process of collecting information on some real-world, physical system, and using this to analyze the system in question. In most cases, the system being measured is an industrial process or scientific experiment, and nowadays the data collected is almost always passed to some form of computer. In recent years, the technology used to collect, process, and analyze such data is available off-the-shelf. In comparison to earlier systems, which were normally bespoke designs specific to a particular field or process, the use of off-the-shelf components means that they can be replaced easily and cheaply. There are many factors to consider when designing and implementing a data acquisition system. First and foremost, the types of sensors used to collect data must be carefully though out. Secondly, the signal output by these sensors needs to processed into a form which is acceptable for a digital computer. Lastly, the software running on the computer being used to collect and analyze data must fit the purpose at hand. For most engineers and scientists today, the standard choice of hardware is a PCI-based system. These systems use a standard connection between signal-collecting hardware and the hardware of the computer used to analyze this data. Though originally designed for the PC, in recent years PCI cards are available that will also work with Mac and other forms of computer system. Today, I will give a quick introduction to the design and implementation of such systems, broken into the three main factors that must be thought about – the sensors used, the choice of signal processing controller, and the hardware and software required to work with the data collected. When designing and implementing any PCI data acquisition system, the first thing that must be considered is the type of sensors required. Whilst there are now sensors available for almost any kind of physical variable you wish to measure, it is worth noting that any sensor is likely to effect the operation of the system you are measuring, and it is therefore wise to use the minimum number of sensors required for your purposes. In practice, this means carefully thinking through exactly the data you need to collect from the system you are interested in, and focusing on that type of data. Typically, one reading can act as a proxy for the total operation of the system – for instance, one of the most common variables measured by PCI data acquisition systems is temperature, which in many cases is used to indicate the smooth operation of industrial hardware. Other examples of common phenomenon that measured by PCI data acquisition systems are light intensity, gas pressure, fluid flow, and force. Typically, PCI data acquisition systems use dedicated hardware to pass signals from sensors to the computer systems that will collect and analyze the data. Converting a messy, sometimes noisy, signal from a physical system into a format that can be used and manipulated on a computer can be a tricky business. One of the first obstacles to be overcome in this regard is signal strength. As outlined above, typically sensors are designed to take the smallest amount of energy possible from the system they are being used to measure. In practice, this also means that the signal they output is of a vey low intensity, and must to amplified to be of any use. It is therefore critical to use an amplifier that is able to amplify the signal cleanly. A noisy amplifier will ultimately warp and color the data collected, which in some cases can render it useless. Another thing to think about when designing a PCI data acquisition system is the type of signal that you will use to pass data between the various parts of your system. Most sensors will output a single ended analog signal. Whilst this type of signal is good at capturing the raw state of the system being measured, it is also very susceptible to noise and distortion. A common fix for this problem is to convert the signal coming from the sensors into a differential signal, which is much more stable and easier to work with. Once the signal has been amplified and cleaned up, it must be fed into a computerized system for collection and analysis. Nowadays, most data acquisition systems use standard PC hardware, meaning that if components of the system fail, they can be easily replaced with off-the-shelf items. The most common format for getting an incoming signal into a computer nowadays is the use of PCI cards and other hardware. Though originally designed for PC, PCI cards compatible with many other systems are now available. These external PCI cards are a solution to a common problem – that with complex data acquisition systems measuring many variables, the number of PCI inputs on a typical motherboard is too few. To work around this problem, an external card is used to combine multiple signals into a single input. 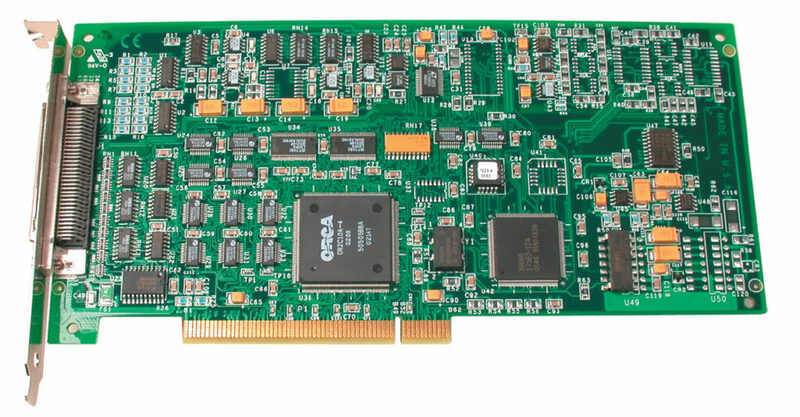 DAQ cards often contain multiple components that are able to perform signal processing before passing the signal to the software. In the most advanced cards, these functions are accessible via a bus by a micro-controller, though some cheaper systems used hard wired logic. For both types of card, proprietary device drivers are often needed. These signal processing controllers are increasingly able to perform quite complex processing on incoming signals. For complex PCI data acquisition systems, this is invaluable for several reasons. First and foremost, it shifts the burden of signal processing away from the CPU, which in large complex systems can become choked by an overload of data. The final stage in processing the signal is to pass it to software. Nowadays, a vast variety of different software solutions are available for use with PCI data acquisition system, and the choice of which to use depends on the type of data being collected and how it needs to be processed. Typically, however, such systems are based on commonly understood programming languages such as C++ or MATLAB, providing a large scope for customization. Which to Choose DAQ Cards or DAQifi Products? Read more about this in our DAQ vs DAQifi post.